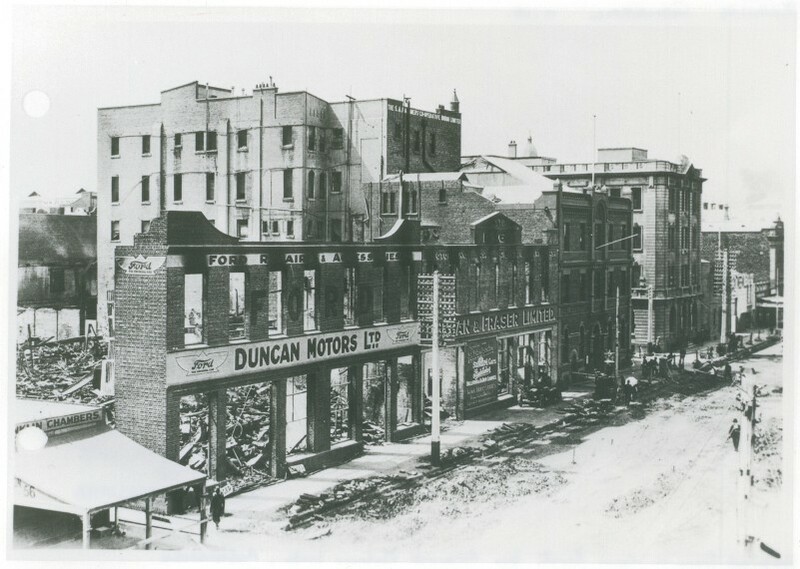 In January 1865, two Scotsmen formed the partnership of Duncan & Fraser and leased a modest, 2 storey premises at 37 Franklin Street, Adelaide. James Duncan, a coach builder by trade and James Fraser, a coach painter by trade quickly earned a reputation for quality at a reasonable price. Indeed, after less than 2 years in partnership they won the prestigious Gold Medal for the "Best Carriage" exhibited at the Duke of Edinburgh’s Exhibition held in Adelaide in 1867. 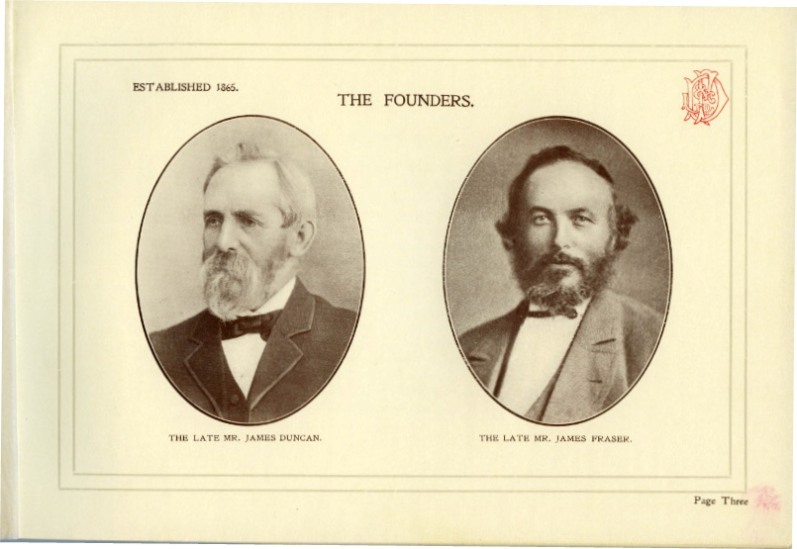 The founder James Duncan & James Fraser taken from the company's 1919 handbook. Photo courtesy of Ian Duncan Smith. Easter 1869 saw Duncan & Fraser bring a curious new invention to Adelaide - the velocipede. The partners caused quite a stir by riding the contraption around the streets of Adelaide with hundreds of people visiting the factory to see it. However, the arrival of the "Penny Farthing" bicycle rendered the velocipede obsolete over night. Sadly only 50 velocipedes were made when production ceased. Within 5 years the growth of the partnership found their existing factory too cramped. Literally over the road a was a run down ice factory on much larger premises. In January 1870 a long lease was secured and the partnership moved into their second factory at 42 Franklin Street. This street address remained with Duncan & Fraser until their closure. A photo of the second factory is the photo in the title page above. This photo taken in 1870 is the earliest known photo of Duncan & Fraser to exist. This amazing photo is courtesy of the State Library of South Australia B2515. The partnership toiled hard in the early years and their efforts were rewarded in 1873 being commissioned to build 2 railway carriages for the Adelaide, Glenelg & Suburban Railway Co. By 1876 Adelaide was in desperate need of public transport and the Adelaide & Suburban Tramway Co. was formed. Little has changed in 100 odd years with the authorities of the day also choosing not to listen to local advice. The decision having been made, Adelaide's first 20 horse drawn trams were fully imported from John Stephenson & Co., New York. On arrival the American manufactured tramcars were found to be unassembled, required painting, assembly and numbering before they could be used. Duncan & Fraser was the only company in Adelaide that had this type of experience and were invited to overcome the problem charging £20 per tram. A valuable lesson was learned and from that point on all of Adelaide’s trams were locally built until only recently. By 1884 the partnership sought larger premises to accommodate their growing coach, buggy and tram building businesses. 16 acres of land was secured near the Kilkenny railway siding. Adjacent to the Port Adelaide railway line, Duncan & Fraser's huge third factory was where all larger type work was carried out for many years. Sadly in 1886 James Fraser fell gravely ill and suddenly passed away on 1st August. James Duncan bought out the partnership for an undisclosed amount from his widow. As a mark of respect for his trusted friend and business partner, the Fraser name remained an integral part of the business for the entire life of the company. By 1909 both South Australia and Victoria were electrifying their tramway systems. Duncan & Fraser built the first 100 electric trams for Adelaide. Cities and towns such as Melbourne, Ballarat, Bendigo and Geelong all had fleets of Duncan & Fraser electric trams with many of them still operational well into the 1960's. 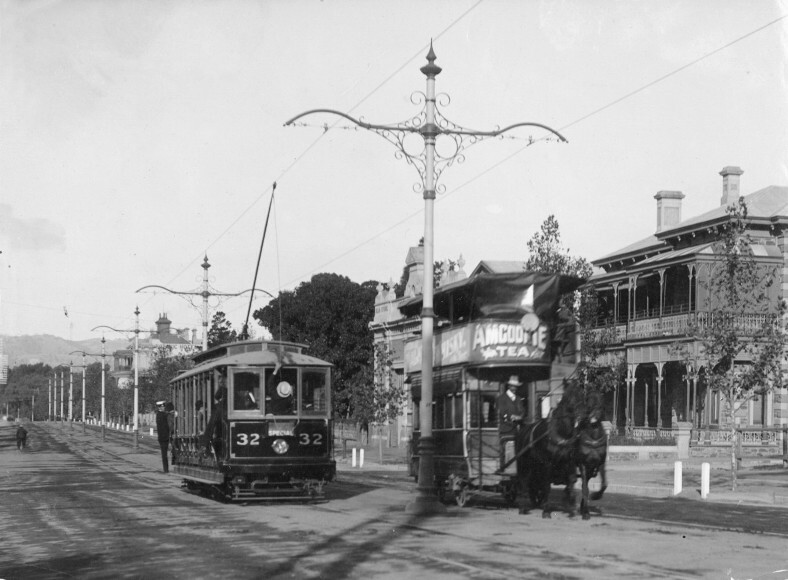 Duncan & Fraser trams; an old horse drawn tram being passed by a new 'B' type electric tram on Hackney Road, Adelaide c1909. Photo courtesy of SLSA B4364. James Duncan instructed his sons to hire a salesman as he had secured the Oldsmobile automobile agency. The Duncan brothers answered an advert from the local newspaper and sent their office boy to invite the person for an interview. The office boy was Fred Mann and the person employed was Bert Cheney, both of whom would have a profound impact on our state in the years to come. Duncan & Fraser had taken the unique step of arranging a showroom, complete with a salesman, spare parts, accessories, clothing and driving instruction, a first for South Australia. On 23rd September 1903 the “Curved Dash” 5HP Oldsmobile arrived in Adelaide priced at £180. Unpacking the car presented the problem of how to drive it. Reading the manual and starting the engine the car "leaped" into an office. With no damage done and only their pride a little dented, a company representative took the car around to Dr. Gunson where he took delivery of the first vehicle on the same day. In late September 1903 a small group of Adelaide's most prominent citizens decided that a club needed to be formed to cater for the new automobile. This new organisation was called The Automotive & Motor Cycling Club of South Australia. Founding members included James Duncan, his youngest son Richard and wife Florence. The Automotive & Motor Cycling Club of South Australia has survived the years and is now known as the Royal Automobile Association. By 1905 the existing factory at Franklin was simply too small to accommodate the rapidly expanding automobile business. The old buildings that had served the partnership so well were demolished for a new 2 storey, brick fronted factory. Completed in 1906, the new factory fronted a whopping 182' on Franklin Street and was now the largest automobile dealership of its time. Through the Franklin Street construction period James Duncan stubbornly refused to hand over control and still managed all of the business affairs. Gradually getting older and more weaker, he finally passed away in 2nd July 1908. The business was now left to his four sons; James Newell, Robert, Archie & Richard. Duncan & Fraser secured many automobile agencies apart from the Oldsmobile including the Orient Buckboard, Argyll, Standard, Singer, Chalmers & BSA. Their greatest coo was in August 1909 securing the sole distributorship for the Ford Model‘T’ for South Australia and Broken Hill against the wishes of their head salesman. The Ford 'T' sold extremely well, so well in fact that by 1912 the "new" factory was too small and extra space was again sought. The Duncan’s decided to use public subscription and on 13th June 1913 the new company was duly registered. The partnership of Duncan & Fraser was now a private company - Duncan & Fraser Limited. Opening hours were lodged as 9am-5pm week days and 10am-noon on Saturdays. As war broke out around the world in 1914, Duncan & Fraser Ltd. would not stop any employee from enlisting. As a matter of fact, Duncan & Fraser Ltd. agreed to hold any postion open for any enlisted employee on their return, the same as it had been during the Boer war. The company set up a fund to assist families and widows during this time. Duncan & Fraser Limited in full swing; 7 out of every 10 cars were Ford cars c1915. Photo courtesy of the Royal Automobile Association. Finally in November 1918 came the armistice. With soldiers returning from service, Australia had to come to terms of life after the war. Sales of automobiles after the war continued to soar and the cheap, reliable Ford 'T' was a driving factor. Although there was a minor resurgence of horse drawn transport during the war, the space required to service it was disproportional to its minimal income. In April 1919 Duncan & Fraser Ltd. announced that all facets of horse drawn transport would be discontinued in favour of the motor car. In late 1918 Duncan & Fraser Limited published their own internal magazine called "The Echo" with a copy being distributed free to every staff member and employee. It was initially published quarterly, but by 1922 interest had grown significantly and "The Echo" became a monthly publication. "The Echo" was discontinued in late 1924. The parent Ford Motor Company in Canada was unhappy about most of the Australian Ford distributorships selling other makes of cars apart from the Ford. Following the company’s directive, Duncan & Fraser Ltd. annexed the Ford agency. In October 1920 Duncan Motors Ltd. was formed to sell and service all Ford products with Duncan & Fraser Ltd. selling all other makes. The early 1920's were boom years where car sales reached record numbers. Duncan Motors Ltd. released their new body that comprehensively modernised the Ford. Duncan & Fraser Ltd. has secured the lucrative Studebaker car agency. The last of the tram contracts had been fulfilled and the 16 acre Kilkenny site was sold off to Holden Motor Bodies. The funds raised were used to purchase land and build a new factory specially designed to manufacture cars. This new factory at Mile End, Duncan & Fraser's fourth, was designed to be rectangular in shape allowing for an assembly line type process, similar to the system perfected in 1913 by Henry Ford in Detroit to manufacture the Ford 'T'. On the morning of 21st February 1923 disaster struck the company when smoke was seen billowing out of the Franklin Street factory. Within a matter of minutes the fire brigade were at the scene. Fueled by petrol and oil and with no internal sprinkler system, the fire rapidly took hold and consumed everything in its wake. Just 3 hours later the once proud Franklin Street premises was a smoldering mess. Although the factory had been totally destroyed, fortunately there was no loss of life. The cost of Adelaide's largest fire was in excess of £90,000. Businesses all around Adelaide offered their help. 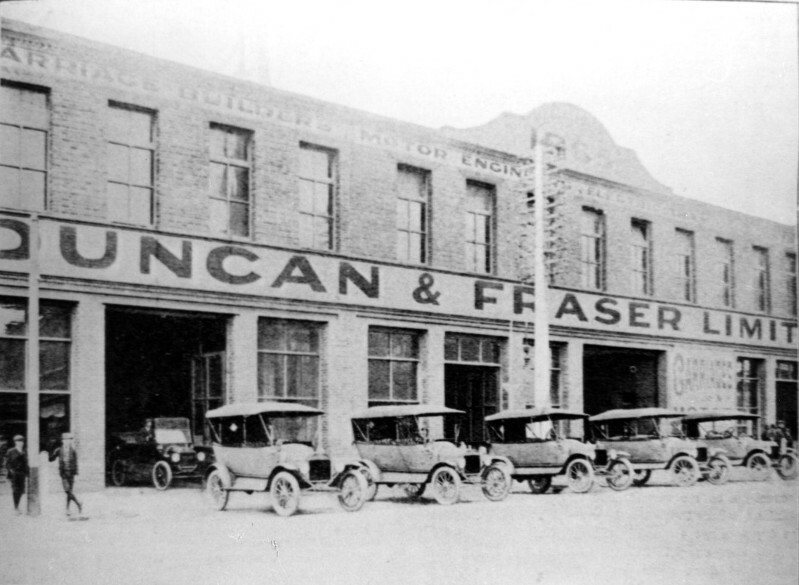 Duncan & Fraser Ltd. & Duncan Motors Ltd. had to set up as quickly as possible allowing them to continue to trade. The new factory at Mile End was under construction and was only 3' high. The Duncans had no option but rent temporary buildings and workshops all over town. A testament to the management, staff and employees of Duncan & Fraser Ltd. is within a couple of weeks of the fire they were already assembling 8 cars per day including Fords and Studebakers. This is a commendable achievement considering all their assembly tools, jigs & fixtures were destroyed in the fire. The fire of 21st February totally destroyed the Franklin Street factory with only 8 cars being saved. Photo courtesy SLSA B46119. For quite a while complaints had been filtering back to Ford Canada about the huge discrepancies across the states with regard to the cost of new Ford cars, spare parts and service. In late 1923 Ford Canada sent two delegates, Hubert French & Mel Brooks, to Australia to investigate these consumer complaints. By January 1924 French and Brooks had arrived in Adelaide after previously visiting the Ford distributorships in New South Wales, Queensland and Victoria. 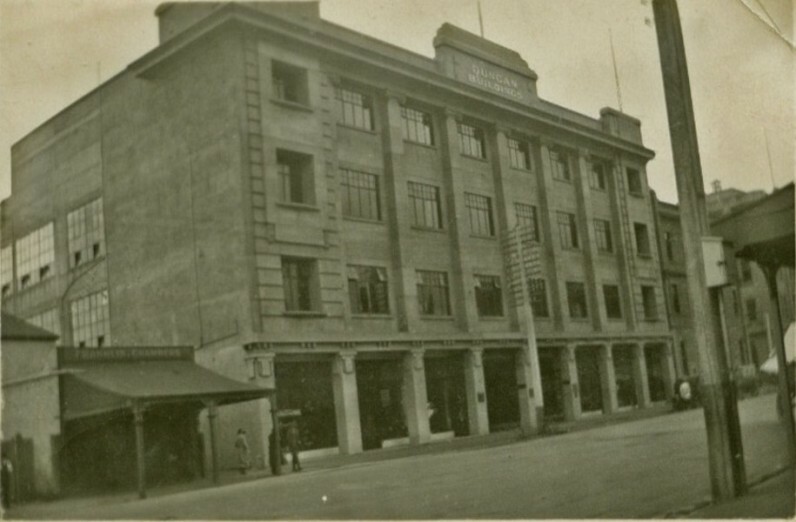 Like all of the other states, French was not impressed by the South Australian distributors and clashed almost immediately with the management of Duncan Motors Ltd. However, French did concede that the bodies being built by Duncan & Fraser Ltd. and being sold through Duncan Motors Ltd. were the best he had seen on his travels. However, this did little to arrest his low opinion. His 200 odd page report on the Australian operations was so damming that it changed the way that the Ford Motor Co. does business in Australia to this day. August 1924 saw the new 3 story factory on Franklin Street open for business. Heralded at the time as the largest, special built car factory in the state and coupled with their own fully operational assembly line at Mile End, Duncan & Fraser Ltd. were back in full production at minimum cost. These excellent purpose built facilities was not what French wanted to see on his return. In March 1925 the Ford Motor Company of Australia was formed with Hubert French as their first Managing Director. Ford Australia’s first Ford was assembled at the Dalgety Wool stores in Geelong and were all fitted with Adelaide made bodies built by Duncan & Fraser Ltd. and supplied through Duncan Motors Ltd.
By May 1926 the genuine "all steel" body panels were being imported by Ford Australia directly from Ford Canada and assembled at the new Ford factory now located at Corio Bay, Geelong. The imported steel body replaced the Adelaide built body and thus ended independent body building by any or all of the states including Duncan & Fraser Ltd. and South Australia on Ford cars. In the face of the oncoming Great Depression, Ford Canada announced in August 1927 that production of the Ford ‘T’ would finally cease. Ford Australia followed suit a week later. All the Ford agents including Duncan Motors Ltd. were informed that they would not have any Ford cars to sell for an estimated 12 months whilst the factories in America, Canada& Australia retooled for the new Model ‘A’. This effectively ended one of the most lucrative car agencies this country had ever seen. Faced with no Ford cars to sell, Duncan & Fraser Limited's other car agencies combined were simply not profitable enough to keep them afloat. The Duncan brothers were faced with the awful business reality of costs exceeding income with no foreseeable way forward. Based on the company's diminishing financial position, the Duncan brothers and the Board of Directors voted and accepted management's proposal to simply cease trading. In late August 1927, after 62 years of solid work, Duncan & Fraser Ltd. and hence Duncan Motors Ltd. closed their doors for the last time.